SANAA (Reuters) – Yemenis held a mass rally in the capital Sanaa on Tuesday to mark the fourth anniversary of a war that has killed tens of thousands of people and pushed the country to the brink of starvation. It was a show of support for the Iran-aligned Houthi movement as the United Nations pushes ahead with tough talks with the group and the Saudi-backed government to find a political solution to the conflict. The Houthis have controlled the capital and Yemen’s largest populated areas since 2014 when they ousted the government of President Abd-Rabbu Mansour Hadi. Men, women and children marched, waving the red, white and black national colors, and chanted slogans against Saudi Arabia, which leads a military coalition against the Houthis, and the United States which backs it. “This is a message to the world, that at the start of the fifth year (of the war), Yemenis will be stronger… a message that the Yemeni resistance will be even greater,” said Mohammed Haidarah, a protester. 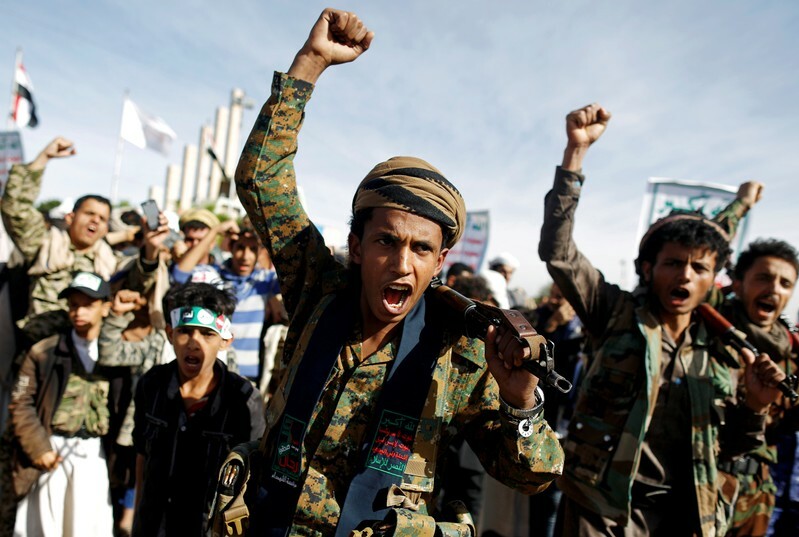 Many painted their faces in the colors of the Yemeni flag and others danced holding assault rifles and traditional daggers as Houthi leaders cheered the crowd from the main podium.